Told you the Mets needed a power bat. In a big rivalry series against the Phillies, the Mets—in a HR-friendly park—totalled exactly zero HRs, in getting swept by Philadelphia. In fact, the Mets totalled 3 runs, 3 doubles and 21 total bases in the 3 games. It may be too late now, but maybe not. The Mets are 2-8 in their last 10 games, and are in 4th place, 4 games out of first. If they are gonna do anything, the have to do it now. Does "Rafa" bother you guys at all? Not the tennis player, the nickname. I'm sorry, don't mean to offend, but it irritates the bejeezus out of me when broadcasters call him "Rafa." Is Rafa-el too hard to say? Speaking of silly tennis subjects, what's with people complaining about "grunting" on the court. Really? is this a problem. W ho cares? I mean, sure, decorum is fine and all, but really. These are athletes trying their hardest to win; if grunting is part of the game, then leave it alone. Looks like the Pirates are doing their annual pre-deadline trading frenzy to dump salary. Hopefully, at least, unlike previous salary dumps, they might actually get something good in return. The early returns on last year's big trades, however, have not been promising. Jose Tabata has seemed to have leveled off at AA-ball. Craig Hansen is a wash. Jeff Karstens and Ross Ohlendorf are journeymen. And Bryan Morris is mediocre at the A+ level. From last year's trades, only Andy LaRoche seems to be doing anything. Let's hope, for the poor Pirates fans sake, that this year's trades are better. Interesting article on the new Yankee Stadium HR "surge." In the end, the slight differences in dimensions are not responsible for the spike in HRs at the new place. Through June 30th, a scientific study shows that comparing the slightly different dimensions would only account for 5 more HRs in the new park. What is it then, wind tunnels? Poorer pitching. Whatever it is, the Yankees should definitely look into it. They don't want a bandbox for a home stadium—the pitchers would hate it, and the team would have a difficult time winning. Ask the Rockies. Interesting speculation regarding the Vikings. No not just the Brett Farve rumors, but actually Marvin Harrison. The scuttle is that Harrison wants to keep on playing and that the Vikings coaching staff might be interested, but presumably only if they can get Brett to sign on the dotted line. Some more interesting scuttle—this time involving the Braves. Word has it that they might be interested in trading Javier Vasquez, even though Vasquez has been lights out—a 3.07 ERA and a WHIP barely above 1.00. Why try to trade him them. See, the Braves have a bunch of good starters, Jurrjens, Lowe, Hansen, etc. And with Tim Hudson expected back within the month, they might actually have too many starting pitchers. Also, the Braves can't hit HRs. At all. Their .396 slugging percentage and their 63 total HRs are among the worst in the league. And seeing that they are only 4 games out of the NL East lead, they might start looking for a trading partner and try to pick up a bat. Matt Holliday? Jason Bay? Adam Dunn? Stay tuned. And finally, those fashionistas, the Oregon Ducks have unveiled yet another new uniform. 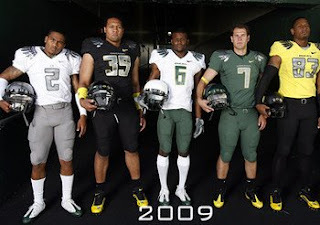 Apparently deciding that their myriad of fashion mistakes over the past decade (see below) wasn't yet complete, the Ducks displayed their new crime against sports fashion. Actually their 5 crimes, as their new unis have a whole bunch of different looks—all of them atrocities. Really Oregon, stop these crimes against young athletes. We beg you. yep, the Braves are indeed considering trading Vasquez. I wouldn't expect them to make a move though until closer to the deadline, they will have a better read on Huddie then too. Jason Bay isn't a factor, the Sox are the only other team out there with "too much" starting pitching at the moment, no interest in Vasquez for them. Rafa...it only hurts to hear someone over the age of 7 say it, like all the people you hear say it in fact. Grunting is out of control, but there are no rules so too late. The Pirates should be better than the Twins, they deal every valuable asset for prospects but never seem to have the couple of seasons in a row to show it works...too bad, classic franchise in such disarray. RE: grunting. I am totally against it. It wasn't so bad with Seles way back when, but now it seems like over half the field does it. They also seem to be getting louder and louder. Chris Evert herself says that the noises get louder on a winner. It isn't the grunting itself, it is that they are trying to use them for an advantage.